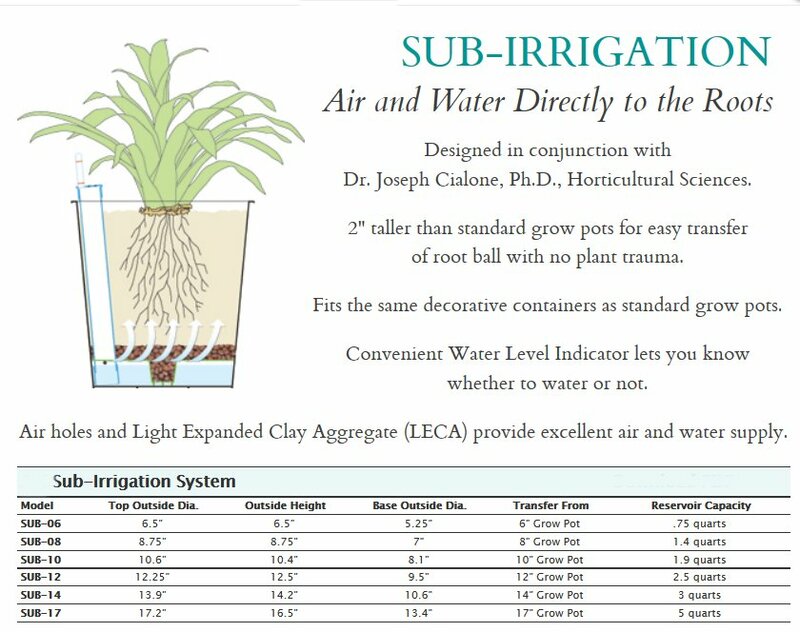 Sub Irrigation Guides....Send requirements for quotes. Several styles and brands - something for every application. Many other styles, sizes and formats available for any project - send your requirements for a current quote. Please send your requirements for a customized quote. Planter Technology’s CWS Manual Container Irrigation system is based on a concept that reaches back to 1972. We were the first company to perfect a system to help maintain pots and plants of all types, and are still the leading player in the marketplace. The CWS system has been used in hundreds of thousands of installations all over the world, and has proven itself to be the easiest to use, most reliable system in the world. Our (available) Instructional Video will also give you a short introduction into how the system functions. Whether on our CWI- or CWM-type container irrigation systems, our SeaCrest Series or Natural Spring decorative planters, or our CWS Planter Liners, the system functions in the same way. The CWS consists of a double-walled container (or a modular reservoir, in the case of the CWM), with a moisture sensor extending from the top of the wall. Water is filled through a hole at the top of the reservoir, and closed with a stopper of some sort. Water flows into the soil mass through small holes at the bottom of the reservoir. The water wicks its way up through the soil (using the soil’s own natural capillary action) until it reaches the white tip of the moisture sensor. The sensor absorbs water from the soil, and blocks the passage of air through the tube. A vacuum develops above the water in the reservoir, which prevents water from flowing out the holes. The valve action of the sensor provides for an optimal balance of moisture and oxygen in the soil. As the plant draws moisture from the soil, the sensor begins to dry, and releases air into the reservoir. The watering process starts all over again. As rain falls, water builds up at the bottom of the container. Because the soil is moist, the sensor is closed, and no water is allowed out of the reservoir. When the rainwater reaches the top of the overflow drain, the excess will drain out. After the rain, the system dries down until the sensor opens up, and the irrigation starts over. Over 25 years of pot & planter experience go into our water-smart technology. All our systems, whether automatic or hand-fill (manual), will help minimize maintenance costs and maximize water management in any container from any manufacturer. AutoFill Automatic Container Irrigation Automatic container irrigation system for any application - uses automatic float valve to control watering. For any container or small bed planting. Modular Plant-In Place System Requires no hand watering, needs water supply. AutoFill Hanging Basket Program Irrigation systems for hanging baskets. Self-contained reservoirs can be either in-basket or on-pole. For baskets between 14"-30" Modular Plant-In Place System with external reservoir Water efficient system allows for extended maintenance schedule. CWM Modular Container Irrigation System Modular manual container irrigation. Use from 1 to 5 modules linked together to provide flexible solution for irregular or large pots. From 24" and up. Fits any round, square or rectangular container Modular Plant-In Place System Use multiple systems for small planter bed applications. 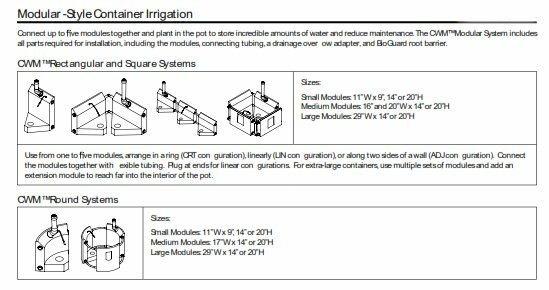 CWI Classic (CWC) Container Irrigation Insert Manual container irrigation insert for tapered pots and planters. Uses vacuum/sensor system for precise moisture control. For tapered pots from 18" to 36" dia. Self-contained insert with drainage adapter Extends maintenance up to 4x longer than hand watering. 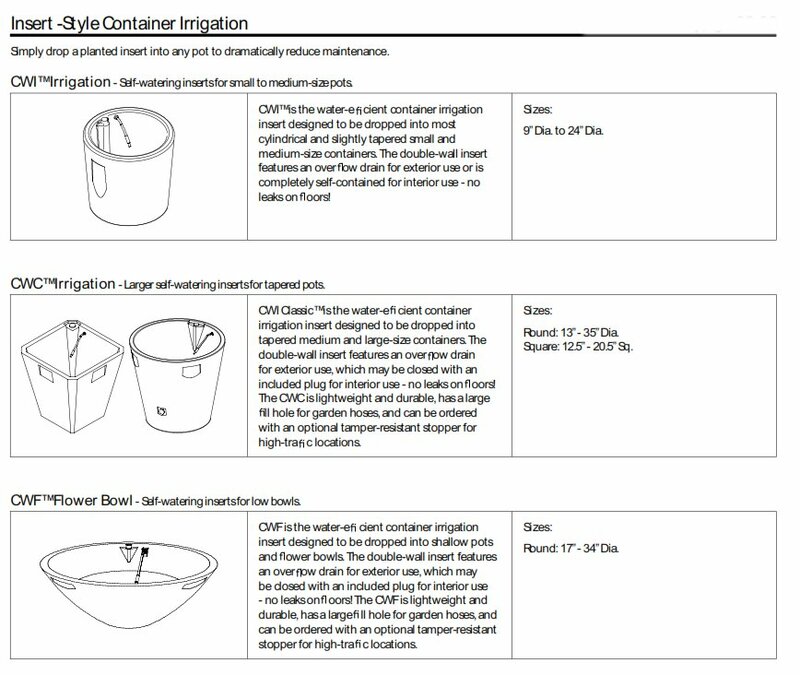 CWI Interior Container Irrigation Insert Manual container irrigation insert for small and medium sized interior applications. For containers 6" to 30" dia. Self-contained insert Extends maintenance up to 4x longer than hand watering. 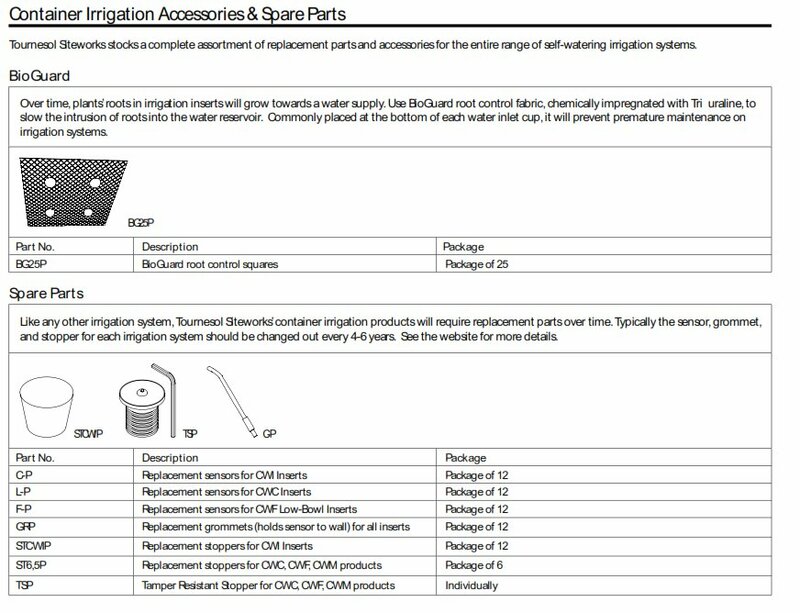 CWI Exterior Container Irrigation Insert Manual container irrigation insert for small and medium sized exterior applications. For containers 9" to 30" dia. Self-contained insert with drainage adapter Extends maintenance up to 4x longer than hand watering. 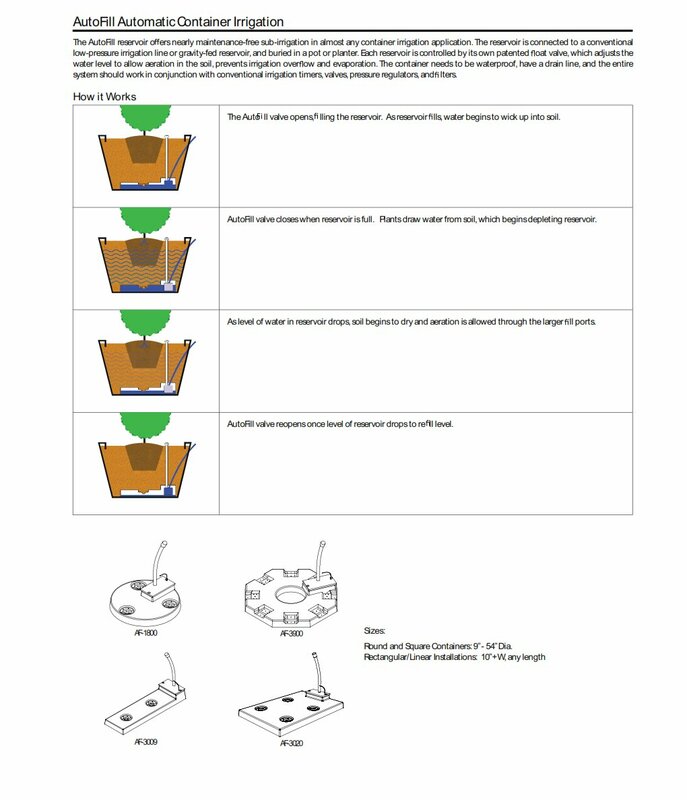 CWF Flower Bowl Container Irrigation Insert Manual container irrigation insert for low bowls and pots. Uses vacuum/sensor system for precise moisture control. Bowls as shallow as 6", 18" to 36" Inside Dia. Self-contained insert with drainage adapter Extends maintenance up to 4x longer than hand watering. CWS Container Irrigation Planter Liners Dpuble-walled liners with container irrigation for low-maintenance applications, planter walls and assembled planters 24" to 72" long, 8" to 32" wide, to 17" deep Unibody leakproof liner Typically with overflow drains for exterior application. Many other styles, sizes and formats available for any project - Please send your requirements for a customized quote. ITEM# SIZE PRICE (* ONE EACH) * Contact us for trade or Volume discounts. Linking modular system for larger plantings.